Costume jewelry manufacturers began producing Christmas pin jewelry in the 1940s. Before that a Christmas corsage was the popular way to adorn a coat lapel for the holiday season. But after World War II, when supplies of metal were abundant American jewelry companies started introducing a wide selection of Christmas tree pins every year. Mostly crafted of metal, they were embellished with shiny enamel, colorful rhinestones, and sparkling colored glass. And unlike corsages Christmas tree pins lasted year after year. All photos on this web page were taken by me and are from my own collection and from jewelry that I've previously sold on eBay. Although women in the 1940s and 1950s could wear their lovely new pins over and over, they demanded new designs each year and jewelry designers gladly responded with more dazzling creations every fall. Women began seeking out the latest Christmas jewelry in department stores as soon as they hit the jewelry counters. They enjoyed wearing a different pins throughout the season. The tradition of Christmas tree pin production by jewelry companies has grown since the 40s. Every year you can find hundreds of newly minted pins Christmas pins in department stores, catalogs and online. The spectrum of designs ranges from minimalist to ornate, and everything in between. And like their predecessors, modern pins are snatched up quickly by collectors. Once the Christmas jewelry is sold out, it becomes collectible and people begin searching sties like eBay and Ruby Land for pins from their favorite designers. Art rhinestone Christmas tree pin from my collection. Some collectors will pay hundreds of dollars for Christmas pins, especially vintage tree pins that have survived in good condition. Also newer jewelry that was manufactured in limited quantities command top dollars. Generally speaking pins made before the year 2000 are more valuable because they were more likely to have been made in the USA, and are higher quality and more attention to detail. You've probably guessed I'm a Christmas tree pin collector myself. I have many different jewelry collections but my costume jewelry Christmas tree pins are some of my favorites. I've got some favorite designers and pieces that brighten up my day whenever I find one at a flea market or antique mall. 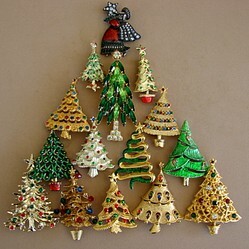 Join me as I share some examples of collectible Christmas tree pins. Eisenberg produced many Christmas tree brooch designs. The company was founded in the 1880s and originally sold clothing. Starting in the 1930s Eisenberg began selling jewelry, and over time their Christmas jewelry began outselling the other Eisenberg lines. Earlier pieces are marked Eisenberg Original. The company is still in business although it was sold to a large corporation sometime in the 1980s. The newer jewelry is of lesser quality and marked Eisenberg Ice. Good to know if you are purchasing vintage pieces. Make sure you if you are paying for high quality vintage, you're not getting the cheaper new version. Hollycraft was in business from 1948 to 1978. The company started out as Hollywood Jewelry. Hollycraft was very prolific in manufacturing Christmas pin jewelry. They designed dozens of trees and interchanged the components - colors, stones, base, branches, & tops - to create many variations from the same molds. Many of their Christmas tree pins came as sets with matching earrings. Hollycraft is known for making lots of Christmas jewelry in colors other than red & green. You'll find tree pins in pastels, clear, muted and neutral colors. They do have the traditional red & green holiday jewelry as well. The Hollycraft company also made Christmas jewelry for other firms such as Kramer and Weiss, so you may find similarities in some of the styles. How About Christmas In July? The patriotic red white & blue tree pin above was created in 2001 after the 9-11 tragedy. It's for sale in my Charmcrazey eBay store and is featured in Warman's Costume Jewelry Figurals Book, page 89. JJ Jewelry began their business back in 1935 in Providence Rhode Island, the hub of American jewelry manufacturing in the early 20th century. The family owned company had several name changes and eventually settled on Jonette Jewelry Company in 1944. Most of the Christmas tree pins you find now are marked JJ on the back. Jonette began that practice in 1970 and they made many tree pins. They are very easy to find online and are still affordable. Jonette Jewelry Company closed in 2006 so look for JJ prices to go up in price as they become more collectible. Does this webpage spark your interest in vintage costume jewelry? It is really fun when I find one I haven't seen before. And I love researching them and reading about the makers. Thanks for commenting. What a fun collection to have. I have an old Christmas tree pin that was my mothers. I never realized how popular they used to be - and still are I guess!